In order to understand and formulate housing policy and programs, it is necessary to have a working knowledge of the internal economic operation of housing from the points of view of both the investor and the owner. James W. Hughes argues that investors' and owners' behavior and activity tend to be governed by market forces and other realities. 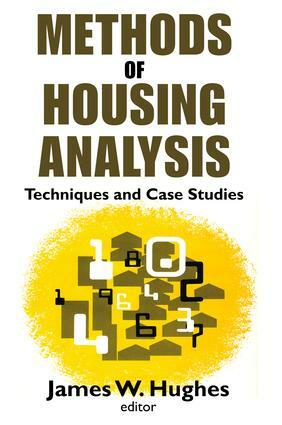 In that regard, he begins this work by analyzing market rates of return in real estate and housing undertakings, and the variety of analytical techniques which underlie their determination.Methods of Housing Analysis is designed to provide urban planners with an introduction to the basic, quantitative techniques associated with the analysis of housing. A myriad of specific analytical methods has evolved in each of the professions concerned with this subject area. Planners, investors, developers, engineers, appraisers, social scientists, and governmental officials all tend to exhibit unique perspectives when examining housing and have developed their analytical frameworks accordingly.The work is comprised of an extensive discussion by the author, detailed case studies and examples, and a number of essays by leading experts that detail specific analytical procedures and demonstrate their use. The book is divided into four major sections: analysis of the internal operation of housing; basic cost-revenue analysis; expanded cost-revenue/benefit analysis; and government regulation of housing. The thorough nature of Hughes' discussion and of the related readings makes this volume an ideal textbook and reference source.